LinkedIn gives you two ways to provide references to others. One is recommendations where you write a paragraph explaining why that person would be a good hire, partner or connection. The other is endorsements. Here you endorse people’s skills with a quick click. Although these take less time and effort than writing recommendations, they matter. When you collect enough endorsements, people can easily identify your strongest skills and expertise. Here are the top tips for taking advantage of endorsements. 1. Endorse others with care. The most effective way to receive endorsements is to endorse others because people like to return the favor and it reminds them to look you up. When they see you’ve endorsed them, they’ll visit your profile and endorse your skills. 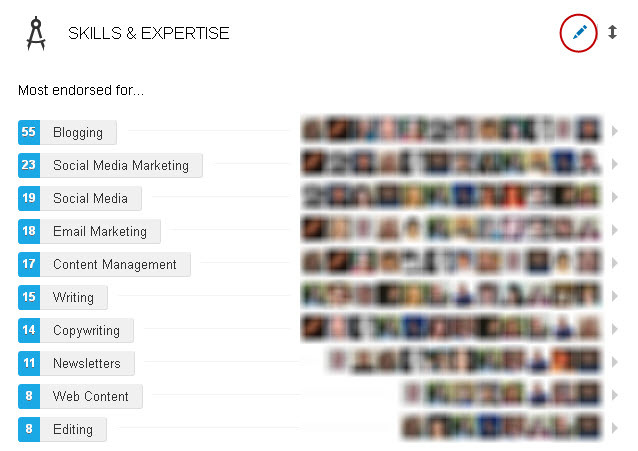 On every user’s page, LinkedIn lists the top skills for that person. Also, LinkedIn sometimes displays four connections as the screenshot in Fig. 1 shows and asks if you want to endorse them for the skills listed. When you prefer not to endorse someone for any of the listed skills, go to that person’s profile and select the skills and expertise you are comfortable endorsing. 2. Reconnect with connections. Endorsements give you a good and easy excuse to check in with someone. 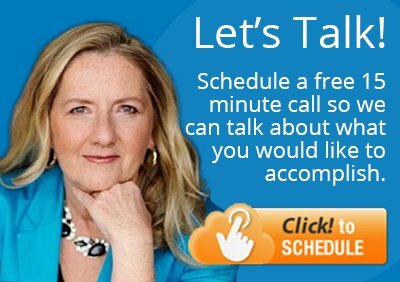 You don’t have to write an email to reconnect. Just visit the person’s page, select the skills and endorse. 4. Control your endorsements. 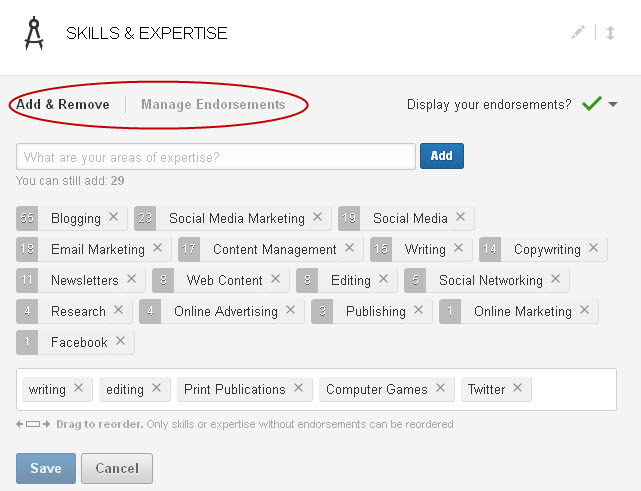 Just like you can control which skills to display, you can also show or hide endorsements by connection. Some people abuse the endorsements feature endorsing others they barely know or for the wrong skills. If you’d rather not display an endorsement from someone for whatever reason, you can hide that person’s endorsement. Or, maybe you prefer to only show endorsements from notable people. It’s up to you. Don’t feel obligated to endorse every skill or expertise that LinkedIn shows. You can remove some and add some. If you’ve never heard someone speak in public, then you shouldn’t feel obligated to endorse that person for public speaking. 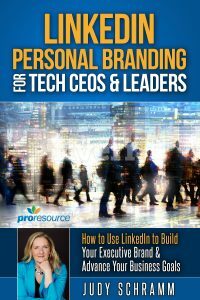 Go visit LinkedIn and spend a few minutes endorsing others. You’ll be receiving more endorsements soon. 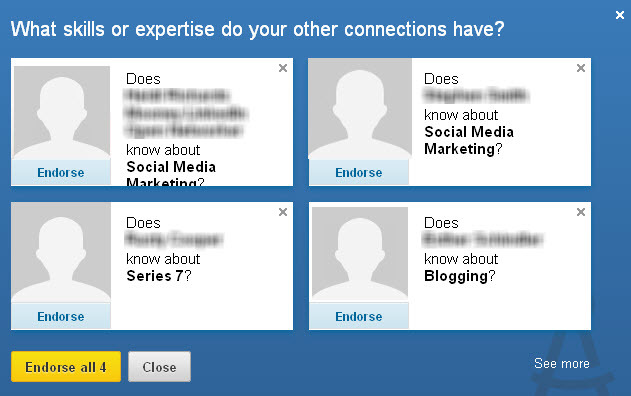 How do you make the most of the endorsements in LinkedIn? What tips do you have?